A creative plot bolsters themes of spirituality, morality, and the afterlife. 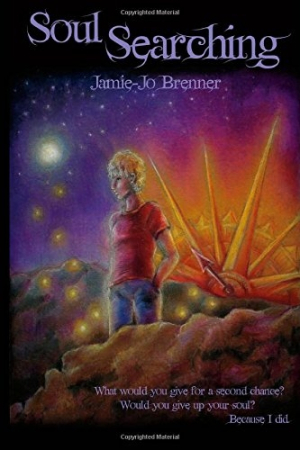 Jamie-Jo Brenner’s debut novel follows Brent, a jaded teenager whose desperate act leads to more loss than he anticipated. Soul Searching contains a clever concept that ambles toward a moralizing conclusion. At eighteen, Brent is an outwardly happy and well-adjusted boy. But his past is peppered with dark spots he’d rather forget. He comes to a drastic decision: he’ll cast a spell that impairs his memory. The incantation proves all too successful. He finds himself sitting in a park with no recollection of who he is, and he’s rescued by Alison, a beautiful teenager of similar moral stock. After a few raucous nights of comic book reading and romantic comedies, Alison’s family helps Brent to the hospital, where he reconnects with his foster parents and high school friends. They all accept his explanation: he’s cast his soul out from his body and remembers nothing. They set on a campaign to help him recover. The story suffers from a lack of focus: pages trade between meditations on what soullessness means, most of which are underdeveloped, and explorations of the teens’ tame exploits. If Brent has truly lost his soul, questions like “would believing in God even matter if I had no soul?” deserve more of a platform than the sparse paragraphs they’re provided. The story seems to lack trust in its most unique elements. Dialogue is overdirected by clunky modifiers, with characters teasing in scathing tones or stating things awkwardly, their true intent lost in the process. Pop culture references abound, dating the book. It is hard to tell what the novel hopes to accomplish. Its themes alternate among religion, the supernatural, the mundane, and the sociological. Lessons regarding bullying and love are plenty. Resolutions around such issues are sometimes more saccharine than convincing; characters demonstrate a remarkable ability to adapt, self-improve, and make “right” choices. Still, it’s the central conflict—the loss of Brent’s soul—that proves most problematic, if only because it receives comparatively little attention in relation to other concerns. No doubt Brent has much to deal with, from swift-returning memories of abuse under a previous foster parent to the challenges of first love, but the pressing matter of his potentially imminent demise, and eternal relegation to dark places, could still be said to take precedence. It also becomes difficult to accept the carelessness of his gallivanting. The book seems to want to deliver some important moral messages: that there’s hope for recovery even from the unthinkably traumatic; that being good is better than being popular; that love is a powerful force. It is unfortunate that many such messages are obscured by a plot that strains credulity, mostly in relation to the elements that should be most relatable. Often intelligent prose and a piquing plot make this novel consumable, if its various conclusions sometimes fail to satisfy. The creative plot introduces a new writer who seems to have much to say.